Boyle told his parents that he was in the trunk of the kidnappers’ car with his wife and children when Pakistani Military forces rescued them. 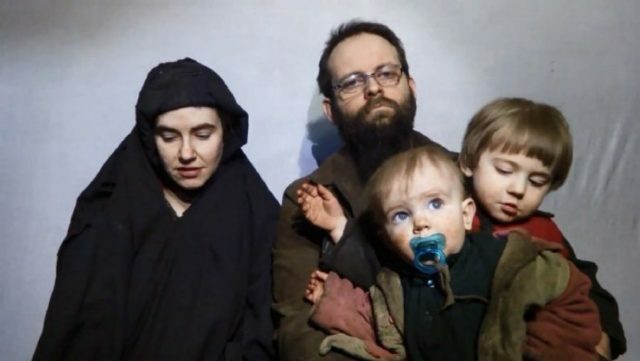 Pakistan Army, operating on intelligence provided by the United States, rescued Caitlan Coleman, her husband Joshua Boyle and their children after locating them in the mountains of Afghanistan. Canadian Joshua Boyle, his American wife Caitlan Coleman and their children are finally free after five years held hostage in Afghanistan by the Taliban-linked Haqqani network. Boyle called his parents early Thursday morning to tell of their rescue. He also told his father that they’ve had a third baby in custody, a little girl who was born two months ago. “Josh said he was doing pretty well for someone who has spent the last five years in an underground prison,” Patrick Boyle told the Star early Thursday, about his conversation with his son. The young family is in Pakistan and plans were underway midday Thursday to fly them home. American President Donald Trump praised Pakistan’s efforts on the rescue mission in his latest statement, says the United States is looking forward to work more closely in the future.